When I began being earnestly interested in British music, I literally plundered the wonderful Lyrita catalogue with zeal and enthusiasm. Nevertheless, I must admit that I missed some of the earlier LPs, and particularly the ones under review. This was for some very simple reasons. First that John White’s name actually meant nothing at all to me until I realised that he had composed a large amount of piano sonatas - Paul Conway mentions 166 of them - of all sizes. Second, I was mostly attracted then by orchestral music, which is why I did not buy the Hoddinott disc either. I thus welcome this opportunity to make belated acquaintance with them. White’s Piano Sonata No.1, composed when he was hardly twenty, is a considerable achievement: the writing is remarkably assured and the formal mastery already quite clear. This is especially clear in the final movement: in effect a passacaglia conceived as a concise recapitulation of what has been heard before in the piece. The Piano Sonata No.4 and Piano Sonata No.5 date from 1959. Both are in a single, albeit at times sectional, movement. They are quite different in character. The Fourth Piano Sonata - incidentally the longest here - is almost a suite in disguise falling into six sections. By contrast, the Fifth Sonata is made up of a series of rather disparate episodes without any apparent inner logic: the music proceeds block-like reminding one of late Havergal Brian as rightly suggested by Paul Conway in his as usual excellent notes. I also agree with Mr Conway when he states that the Fifth Sonata is one of the composer’s most enigmatic pieces - although to be quite frank with you, I certainly do not know as much about White’s music as Paul. I found the Fourth Piano Sonata quite enjoyable and readily accessible. The Piano Sonata No.9 is a step forward to the greater concision that characterises some of the later sonatas. In spite of the brevity and compactness of the piece, the music is tightly argued - no mean achievement. The music of these early piano sonatas is still largely indebted to a wide, mid-20th century tradition; and, as such, is eminently accessible, if a bit eclectic. Since then, John White has continued to compose yet more piano sonatas, some of which are available on NMC D038. I really should listen to that disc which contains a selection of the sonatas from No.15 up to No.124 all played by Roger Smalley. 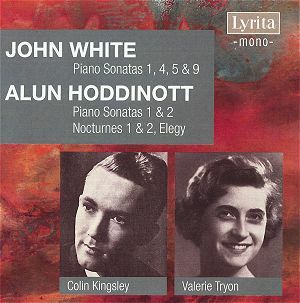 Hoddinott’s piano sonatas are somewhat better known, were it only because commercial recordings of the first ten were released by Nimbus several years ago (Martin Jones on NI5369 and NI5370). After these recordings were made, Hoddinott composed three later sonatas that still await their first recording. However, at the time these Lyrita recordings were made, the works were still fairly new and little known, although John Ogdon had recorded the Second Piano Sonata for EMI on LP: ALP 2098. The Piano Sonata No.1 Op.17 already represents Hoddinott at his most personal and the music clearly displays many characteristic fingerprints that make it immediately recognisable. The Piano Sonata No.2 Op.27 is if anything more mature than its predecessor. However, it is rather more concise and, as a whole, conveys the lasting impression of a composer in full command of his aims and means. The LP also included three shorter piano works that, curiously enough, have, I think, never been recorded since then. Hoddinott has composed a number of works or movements titled nocturne or night music. These include Nocturnes and Cadenzas Op.62 (now re-issued on Lyrita SRCD.332) and Night Music Op.48 (1966, once on ARGO ZRG 824). The fairly early Nocturne No.1 Op.9 was preceded by a yet earlier orchestral work Nocturne Op.5 (1952). The music of the two Nocturnes and of the Elegy Op.18 No.3 speaks for itself and does not call for any particular comment, except to say that each perfectly achieves a maximum of expression with a minimum of means and in a perfectly judged time-span. I should add that the Elegy Op.18 No.3 was later incorporated into a four-movement suite for clavichord or piano. These performances are, without doubt, excellent, the more so when considering that these players have had a lasting association with both composers and their music. Colin Kingsley gave the first performance of White’s First Piano Sonata and was the dedicatee of the Fourth Piano Sonata as well. He also gave the first performance of Hoddinott’s Second Piano Sonata. Valerie Tryon, too, had a long association with Hoddinott’s music since she premiered a number of his piano works. The sound is still remarkably fine throughout in spite of its age, which says a lot about the quality of Lyrita’s recordings. In short, this is a most welcome re-issue and is well worth having for the White Sonatas and for the three shorter Hoddinott works of which this is the only available recording.